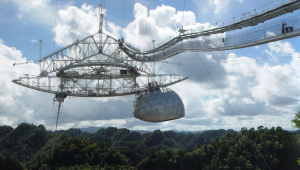 What's ahead in 2014 for Astronomy and Space Exploration? 2013 was an exciting year for both astronomy and space exploration.1 Looking ahead, what can we expect during the next 12 months? The Ghost of Comet ISON? 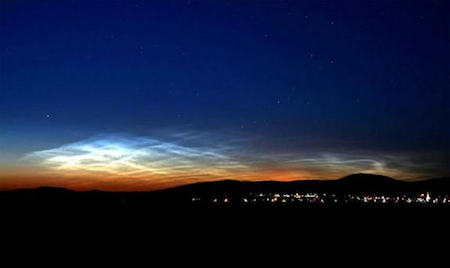 Noctilucent clouds over Budapest, Hungary on June 15, 2007. Despite the fact that comet ISON broke up in late November 2013 as it made its closest approach to the Sun, we may yet have a chance to experience the comet here on Earth. According to veteran meteor researcher Paul Wiegert of the University of Western Ontario, “for several days around January 12, 2014, Earth will pass through a stream of fine‐grained debris from Comet ISON.” Unlike a typical meteor shower where particles burn up upon entry into Earth’s atmosphere, however, the particles in the debris stream from Comet ISON are so tiny that the atmosphere will quickly slow them to a stop. “Instead of burning up in a flash of light, they will drift gently down to the Earth below,” says Wiegert. NASA scientists speculate that the tiny particles of Comet ISON debris just might provide the seeds for a noctilucent display.2 Electric‐blue ripples over Earth’s polar regions might be the only visible sign that a shower is underway. It is just as likely, however, that the entire encounter may pass entirely unobserved, and the remaining specks of “Comet of the Century” ISON could disappear without notice. On October 19, 2014, comet Siding Spring will pass just 76,428 miles from Mars, based on current estimates. When astronomers originally calculated the comet’s trajectory in early 2013, they believed there was a 1‐in‐600 chance that Siding Spring might hit Mars in October 2014, but thanks to subsequent observations, the comet’s trajectory has been mapped far more accurately and the likelihood of a collision has dropped to essentially zero. Even if Mars is at no risk from comet Siding Spring, however, NASA scientists remain concerned that the comet flyby could pose some risk to its orbiters circling Mars. Given the comet’s close approach to Mars, it is likely that both the planet and the orbiters will pass through the comet’s coma. And while the thin Martian atmosphere likely will be enough to protect the planet (and the Curiosity and Opportunity rovers still operating on Mars’ surface), the various orbiters still may be at risk. If that risk still exists in October when comet Siding Spring is about to pass Mars, NASA can take proactive steps — such as changing the orientation of the orbiters — to reduce the possibility of any collisions with cometary dust particles. A total lunar eclipse will occur on April 15, 2014 (visible over east Australia, the Pacific, and North and South America) and again on October 8, 2014 (visible in in Australia, the Pacific, North America and eastern Asia). Lunar eclipses occur when the Moon is on the opposite side of the Earth from the Sun and passes through Earth’s shadow. In addition to the two total lunar eclipses, there also will be two partial solar eclipses during 2014, when the Moon will pass in front of — and partially block — the Sun. On April 29, 2014, people in Australia and Antarctica will see the Sun dim, while on October 23, 2014, the Sun will dim over North America and extreme eastern Russia. Discovery of the first Alien Earth? A number of astronomers expect the discovery of the first “alien Earth” or “twin Earth” to occur very soon, probably during 2014. Such a planet would be a rocky world nearly identical to Earth in size and density, orbiting within the Habitable Zone (where liquid water can exist) of a yellow star like our Sun. Our ability to detect exoplanets continues to improve to the point where astronomers now are finding planets the size of Earth (and even slightly smaller). Given that new exoplanets currently are being confirmed at the rate of several hundred a year, it becomes extremely likely that we will find the first alien Earth very soon. 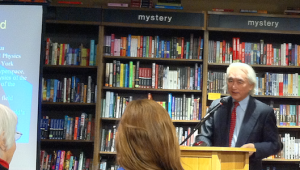 Back in July 2013, NASA Kepler Project Manager Roger Hunter told attendees at Chicago’s Adler Planetarium that the discovery of an alien Earth is “likely” to arise from data already collected by NASA’s Kepler spacecraft.3 In addition, a study published on November 4, 2013 in the journal Proceedings of the National Academy of Sciences estimates that one in five Sun‐like stars observed by the Kepler spacecraft has an Earth‐like planet orbiting in the Habitable Zone. In August 2014, the European Space Agency’s Rosetta spacecraft — launched in 2004 — will reach its final destination4 of comet 67P/Churyumov‐Gerasimenko. 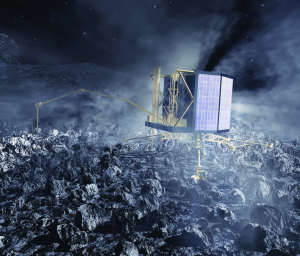 Rosetta5 will observe the comet close‐up, then during November will launch its Philae6 lander to the comet’s core. Comets are the most primitive objects in our solar system and their chemical compositions have not changed much since their formation, thus reflecting the chemical composition of the early solar system. Philae will examine rocks and materials within comet 67P/Churyumov‐Gerasimenko that date back 4.5 billion years in the hope of learning more about the early solar system. In addition, comets carry complex organic molecules which can be delivered to Earth through impacts. Volatile light elements carried by comets may also have played an important role in forming Earth’s oceans and atmosphere. Observations by Rosetta and Philae should help us understand the role comets may have played in the origin of life on Earth. This artist’s concept shows the MAVEN spacecraft with the planet Mars in the background. During September 2014, two more spacecraft will join the fleet of robotic explorers already at Mars. 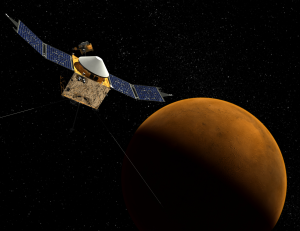 NASA’s MAVEN (Mars Atmosphere and Volatile Evolution) will examine the Martian upper atmosphere, ionosphere and interactions with the sun and solar wind. Scientists hope to use the data collected by MAVEN to help solve the mystery of exactly how Mars lost most of its atmosphere over the ages, and better map the history of Mars climate, liquid water and ultimately habitability. The other spacecraft en route to Mars is Mangalyaan, India’s first planetary mission. Mangalyaan will map and photograph Mars from orbit, allowing India to test its space technologies and gain experience with interplanetary exploration. The mission has already provided some real world challenges to engineers and scientists after Mangalyaan’s launch placed it in an incorrect orbit. A series of five adjustment maneuvers corrected the spacecraft’s orbit, allowing Mangalyaan to achieve the desired trajectory toward Mars.